Software developers are problem solvers. Although they can be very tenacious about finding solutions, the moment they have one they want to share it with the world; the feeling of shipping code is great. Code that is never executed for users is no more than a digital waste product. To prevent building waste, modern software developers ship functionality to their users in short iterations and small increments. The goal of this tutorial is to show you the essential building blocks of a modern software development pipeline, and how to assemble those blocks. It’s not about any programming language or software development methodology in particular. Maybe some of the building building blocks do not match your technology stack of choice. Even if that’s the case I still advice you to go through all the steps. Once you have a basic understanding of the complete end-to-end pipeline you can make it easily fit your specific needs. Full disclosure: I’m one of the developers on the Better Code Hub team. Update August 2017: Eran Barlev from codefresh.io published a short video on LinkedIn demonstrating how Codefresh can replace some of the building blocks described in this tutorial. Since no two software products are the same, development pipelines can vary too. 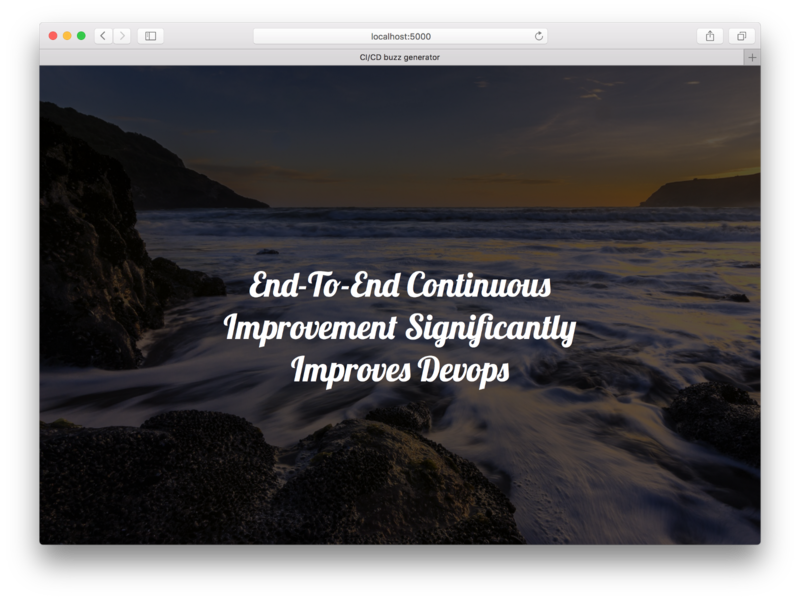 Be sure to check out Eran’s video to see an alternative implementation of a modern CI/CD pipeline. We need a small piece of software that will travel through all phases of the pipeline, from your laptop to the cloud. In our case this piece of software is a little CI/CD buzz generator program written in Python. Create a new directory (let’s say we call it ‘cicd-buzz’). Inside this directory create another directory called ‘buzz’ and in this directory save the snippet below to a file called ‘generator.py’. Login to GitHub (get an account first if you don’t have one already) and create a new public repository called ‘cicd-buzz’. [cicd-buzz] $ git commit -m "Initial commit"
If the last command above complains about access rights, make sure you’ve added your SSH key to your GitHub account. Travis CI is a hosted service for Continuous Integration work. It’s free for public GitHub repositories and getting a Travis CI account is just a matter of visiting https://travis-ci.org and logging in with your GitHub credentials. [cicd-buzz] $ git commit -m "Add Travis CI configuration"
Now that we have a well oiled pipeline that continuously checks the functionality of our code with automated tests, the temptation is strong to focus on functionality and forget about quality. Better Code Hub is a hosted platform that checks the quality of your code according to the 10 guidelines for maintainable, future proof code. Better Code Hub is a watchdog that continuously monitors our development work (literally every push to GitHub) and notifies you when the quality is at risk. Better Code Hub is, like Travis CI, a service that seamlessly integrates with GitHub. To attach it to our repo, go to https://bettercodehub.com and choose the login button that says Free. After logging in with your GitHub credentials, the next page lists all your GitHub repositories. Find the repository called ‘cicd-buzz’ and press the play button. Better Code Hub will then ask you if it’s fine to run the analysis with the default configuration. Click ‘Go’ and wait a few seconds, the analysis report should now be on your screen. Nice job! 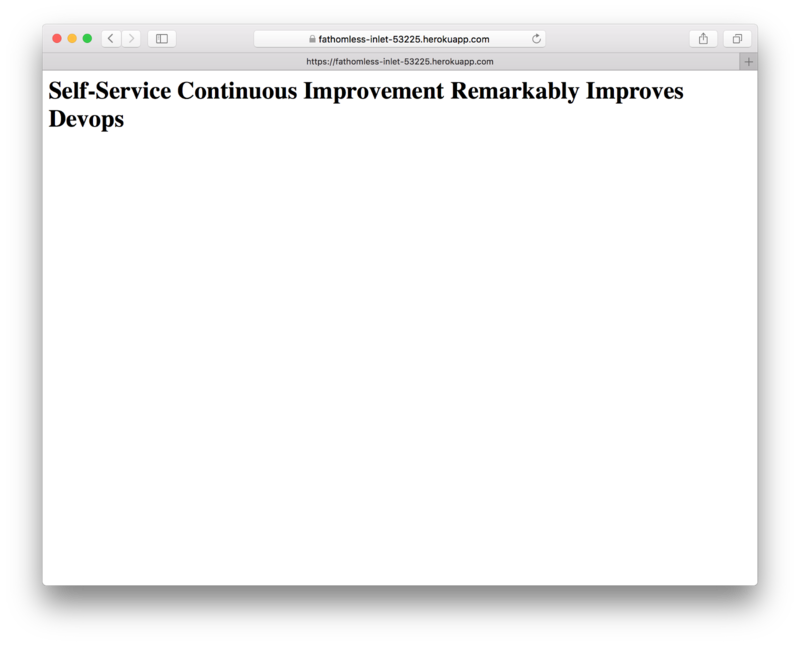 You already have a continuous integration pipeline that checks for functionality and quality at this point. Next step is to continuously deploy your software whenever all tests pass. Open the location http://localhost:5000 in a browser and admire your achievement. Hit refresh a couple of times, just for fun. [cicd-buzz] $ git commit -m "Step 6"
And enjoy watching Travis CI and Better Code Hub picking up this push! We’ll use Docker to create a single self-contained, deployable unit of our web app. For a simple Python Flask app this may look like a lot of overhead but deploying different versions of your code base as a small, self-contained unit has a lot of benefits when your system grows over time. The above tells docker to pick the alpine base image, install Python and pip, and also install our web app. The last line tells docker to launch the web app whenever the container is launched. [cicd-buzz] $ docker build -t cicd-buzz . [cicd-buzz] $ git commit -m "Step 7"
Heroku is a cloud platform for hosting small and scalable web applications. It offers a free plan so go to https://signup.heroku.com and sign up if you haven’t already done so. After these commands you should be able to access the app at the url reported by the heroku create command (or alternatively run $ heroku open). Note that the heroku container:push web command, pushes the same container to the Heroku platform as you’ve pushed to the Docker Hub registry. And finally add 2 more environment variables to your repo at Travis CI. You can find the Heroku API key under your Heroku ‘Account Settings’. The Heroku App name is the name reported by the heroku create command. Commit and push these changes to GitHub. A new Docker image should now be pushed to both Docker Hub and Heroku after the build succeeds. Check a running instance of your app by locally running the latest Docker image:docker run --rm -p5000:5000 -it robvanderleek/cicd-buzz:issue-1 You can also share this container with others.